The month of July in Florida can be rather toasty, my friends … The humidity can soar to a funky factor that can be a real challenge to appreciate….drip drip drip, as the sweat beads creep down my chest…. but as a Southern guy at heart, it just feels natural… I actually love it. And as I embrace the heat and humidity, it is a great time to feel so young in America's oldest city… I arrived back at Glory Days in late June, and upon arrival, immediately opened all the hatches and turned on all the fans I could find just to get some air moving around my Glory Days nest… there' no AC on board, but the thing I do with this wind tunnel I create with fans seems to work. And as you can see from the photo below, it is also time to break out the shade tarps as she rested and smiled on her mooring ball #28. Here, I enjoyed a fabulous view of the water, the city, the bridge, and the occassional boat traffic in the area. I was surrounded by about 30 other boats in the mooring field. Shade tarps may look a bit tacky, but hey, they sure cool things down below. And another thing, there is one heck of a current in this waterfront city … and it seems to be pretty constant, changing with the tides, and always a factor to deal with when approaching your boat or dinghy-ing back and forth to town… The tide here rarely has much of a slack period… what little there is is brief... so be careful should you fall in or go for a swim …. the flow is like a river, and you could get swept away if you aren't a strong swimmer… continual moving current like this also makes for an abundance of unwanted growth of algae and barnacles on the hull of your boat… I winced when I saw the barnacles because I was hoping get another season out of my bottom paint job… evidently not. Glory Days has enjoyed a month at this spot, but it's almost time to pack up and move a little further north. "A free man is free to acknowledge his fears, without hiding them, or hiding from them. Live with your lips pressed against your fears, kissing your fears, neither pulling back nor aggressively violating them." 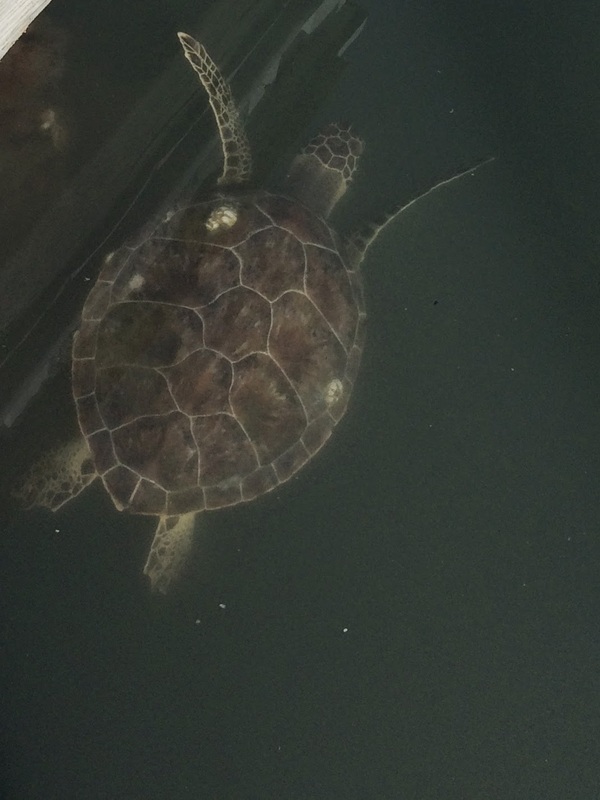 It's not unusual to find sea turtles like this guy in the marina, munching on that green stuff that seems to grow on docks… Cute little guys that linger all around the place. 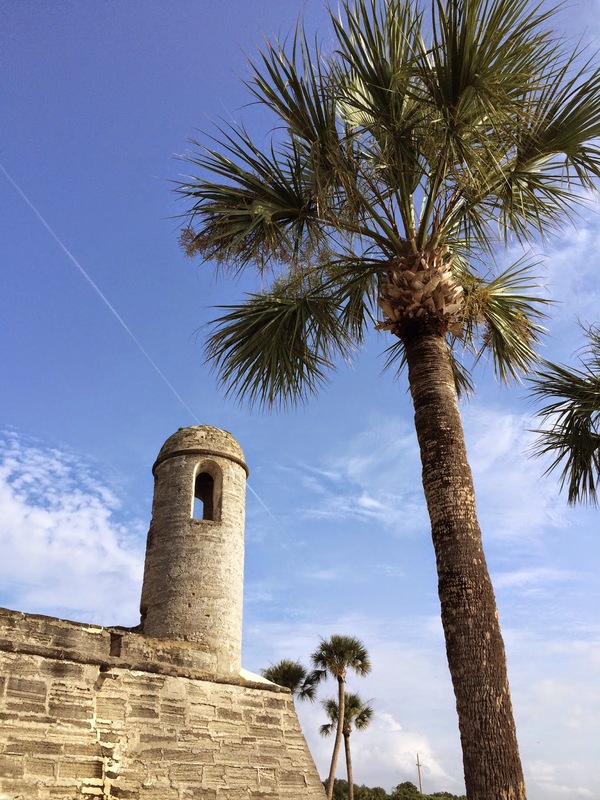 St. Augustine, Florida… The oldest city in America. If you've never been here, it is surely worth a look. Next year, they will celebrate their 450th anniversary. I'm not much of a history buff, but I do know the place is crawling with stories, tales, mystery, and true facts about the origin and progress of this colorful place in American history. Cobblestone streets, weathered store fronts, and a real fort are a few indicators of a time gone by. 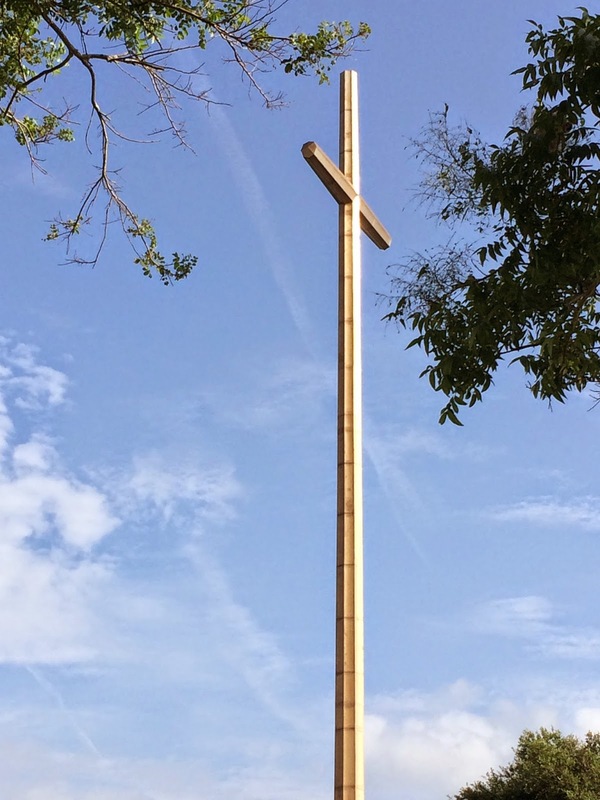 As you would imagine, it is also a popular tourist destination with all types of attractions, sites, and activities centered around the Spanish occupation way back in 1565 and the days of Ponce De Leon…. some of it cheesy some of it authentic. The original Spanish Fort pictured here still stands and serves as a centerpiece of the downtown district. Can you imagine what it would have been like just trucking around that fort each day? "Who will be tortured today? Should I fire a cannon today or not?…." I'm sure there are exciting stories as well as tragic one that occurred here. I always wonder in my mind "if walls could talk…" the heroic deeds done, the cowardly acts, the brutal force of nature, and the tender love between a man and a woman's first glance across the fort yard… ok… sorry i'm getting off the topic here… things wander, including my mind… I better go find it… back to the blog! 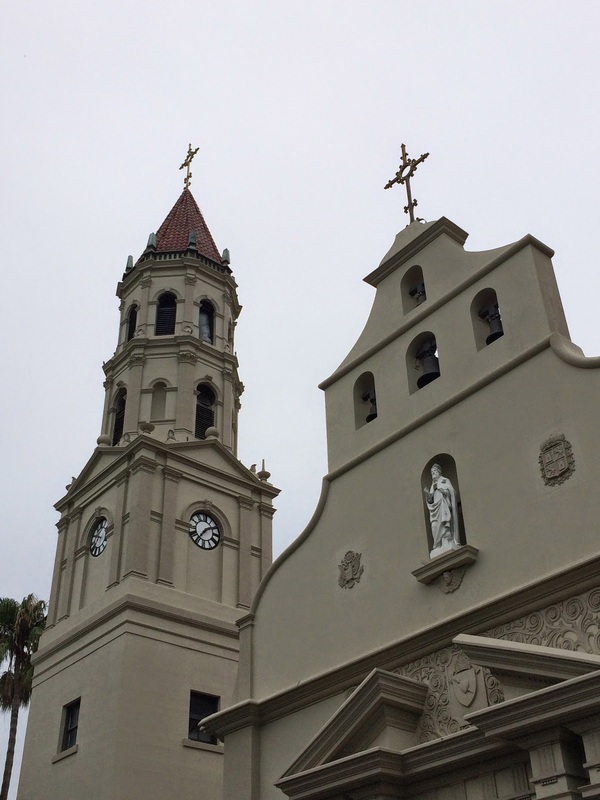 Other sights around the St. Augustine area. Oh the magical buzz I get whenever a mighty osprey soars over my soul …. 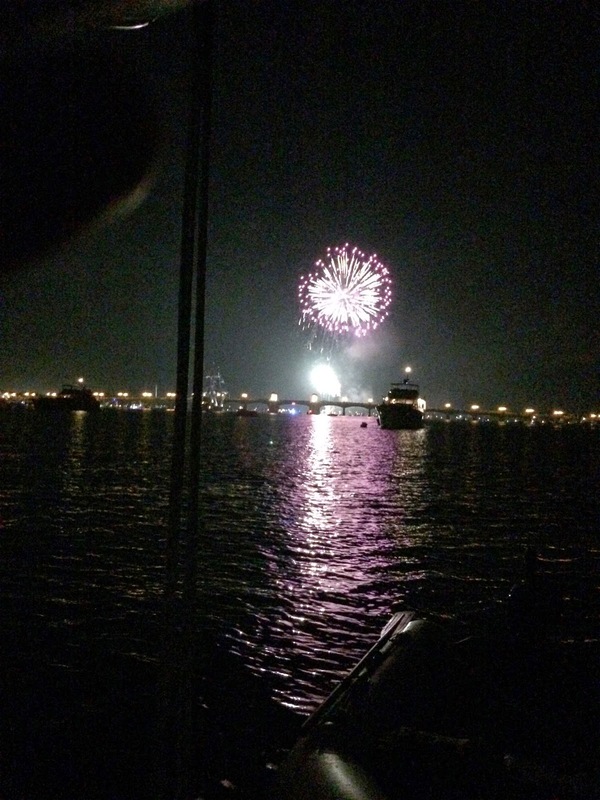 Fireworks as viewed from Glory Days… Happy 4th all. The town is bustling with folks walking all around… You'll see a fair number of street people, a few drunk people, geeky families with fair skin, street musicians, meter maids, and couples in love… Also, there's lot of restaurants and live music spilling out of nearby pubs and eateries… it's a good site for people watching… On the Fourth, I meandered here and there, taking in the sights as Glory Days was just in sight all the time… waiting patiently for her next departure… she's like a horse in a stall sometime wanting to break free… easy girl. I bought a 3 day pass for $20, and corruptly changed the date on my pass from July 1 to July 7 to enjoy some extending time. 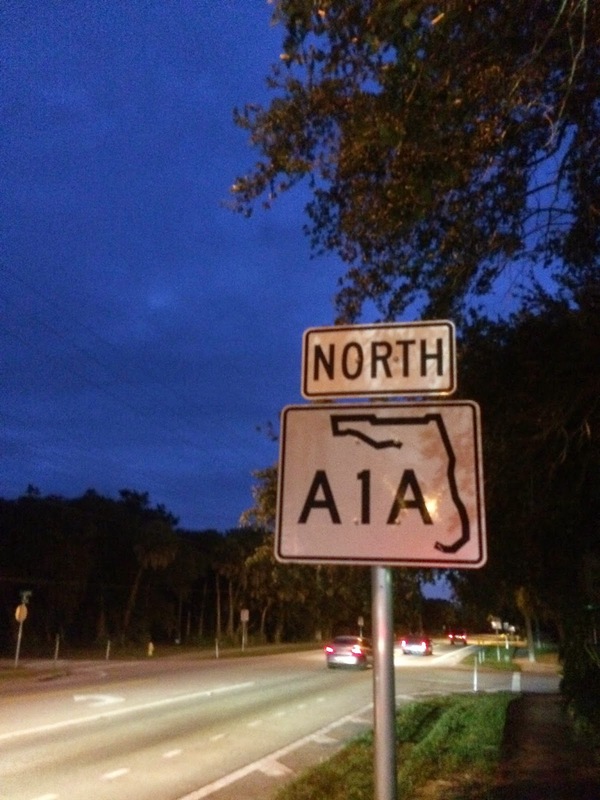 It was so easy to change a 1 to a 7… ok, I broke a law….No one seemed to know it, but me... and God. It's just a little civil disobedience, officer. "Every man knows that his highest purpose in life cannot be reduced to any particular relationship. If a man prioritizes his relationship over his highest purpose, he weakens himself, disserves the universe, and cheats his woman of an authentic man who can offer her full, undivided presence." 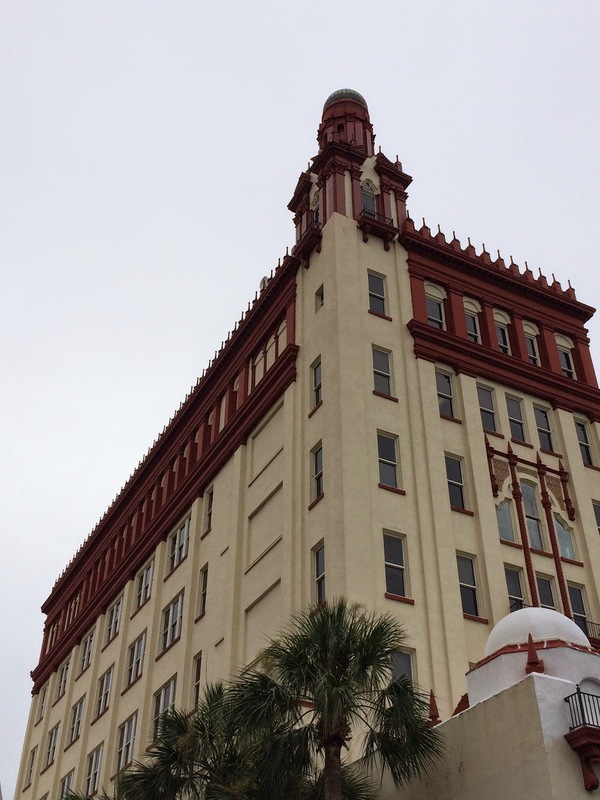 Ah, the Spanish Fort...The downtown district offers an interesting taste of Spanish architecture that has been well preserved with the likes of Flagler College (pictured below) and other aging structures that give St. Augustine a unique landscape view all its own. 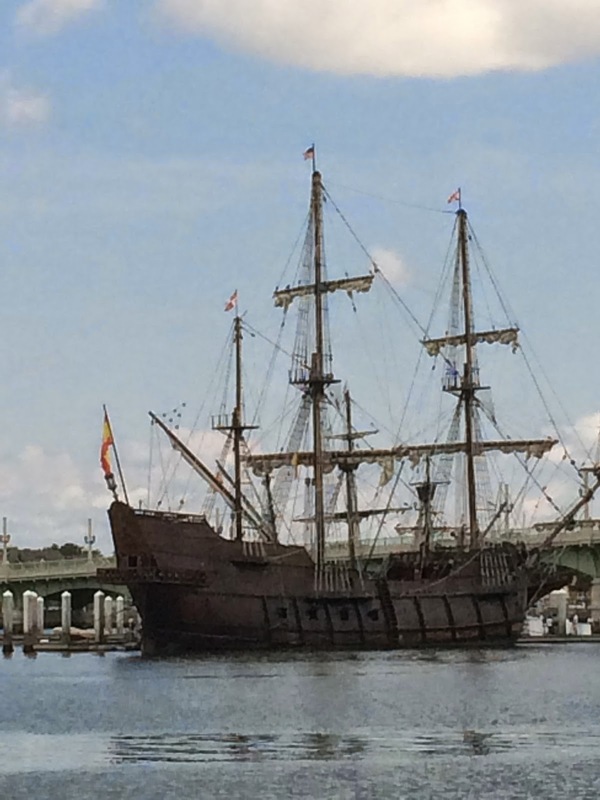 This replica of a 1500's vessel was on display here all summer… She's a nice backdrop to a very old city. 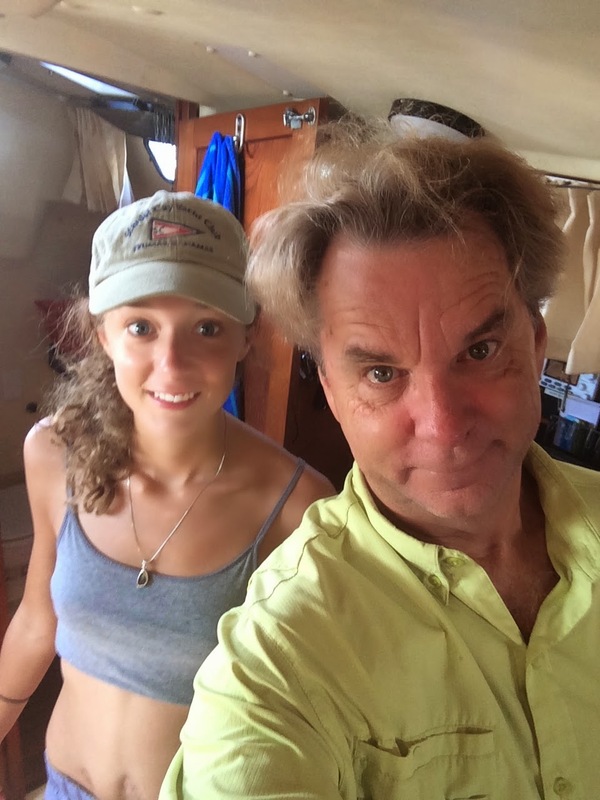 Once again, my daughter, Amy, was on hand for a few days to see her Dad in his element… She's a great boater and not bad at cooking and steering the dinghy into shore. Plus she's a good sport! "Please help us to be normal…." 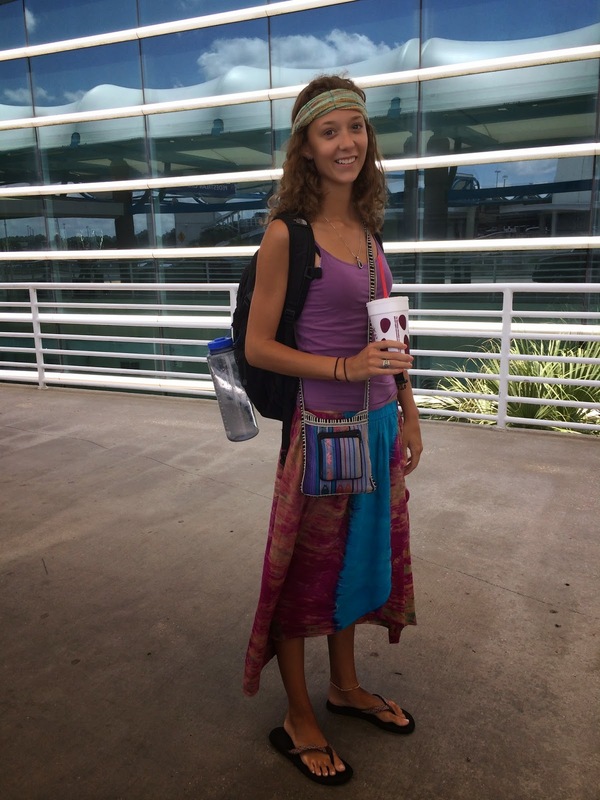 Amy, my little hippie girl here, about to board a flight back to Atlanta… Dad must stay on to watch the ripples and guard the sunsets. seemed to have some class. 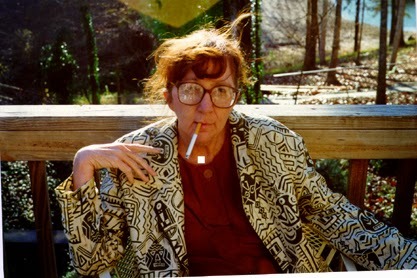 I'll close this post with another round of People Pictures with my goofy captions, as per requested by other fine blog followers just like you! 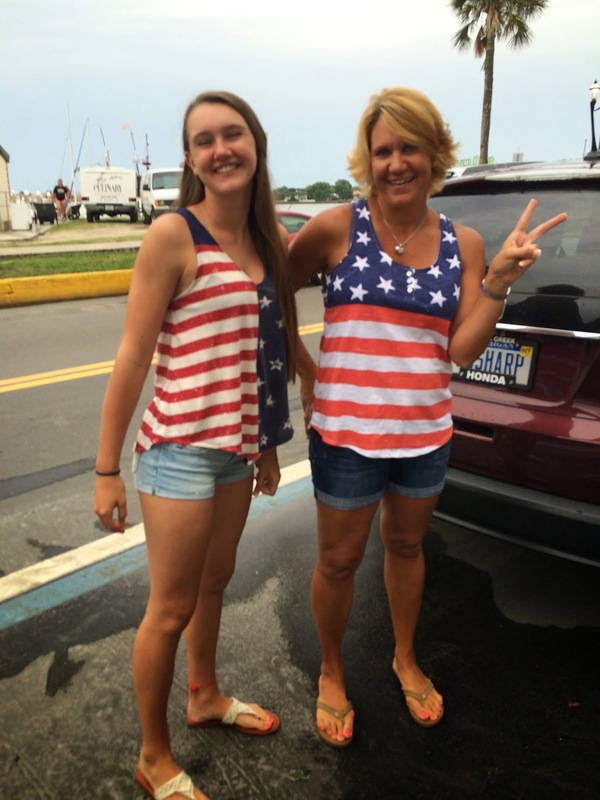 "We are really Russian immigrants just trying to fit in here." 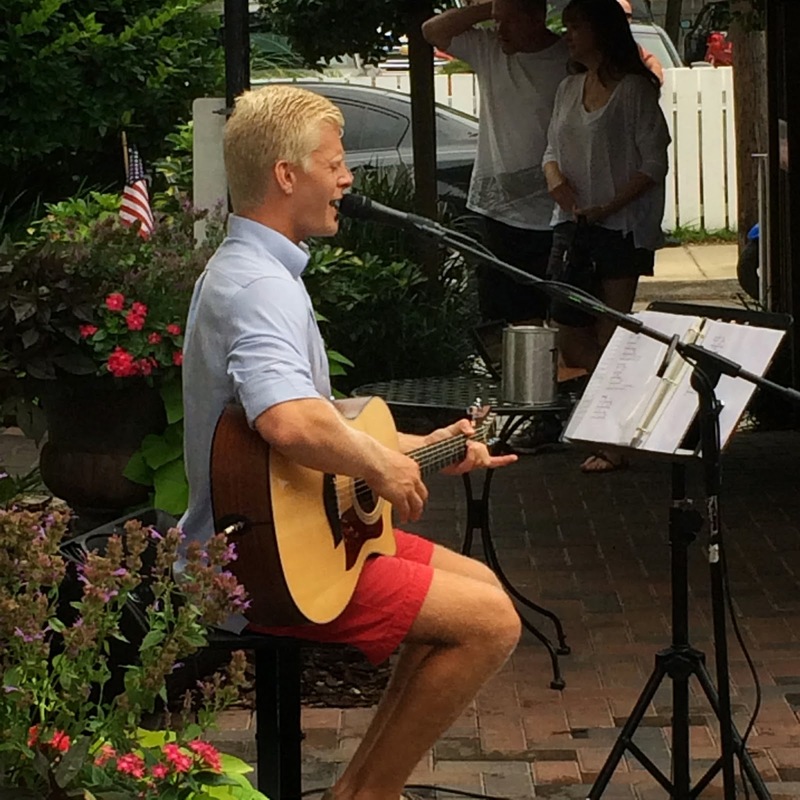 "And YES, I can play the guitar while demonstrating perfect posture! 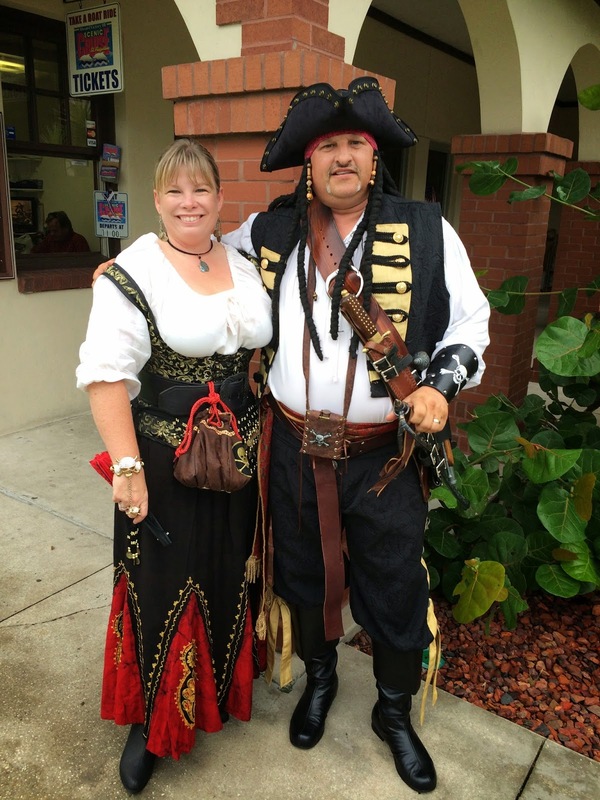 "We work the local pirate ship tour and steal money from tourists … and it's all legal!" 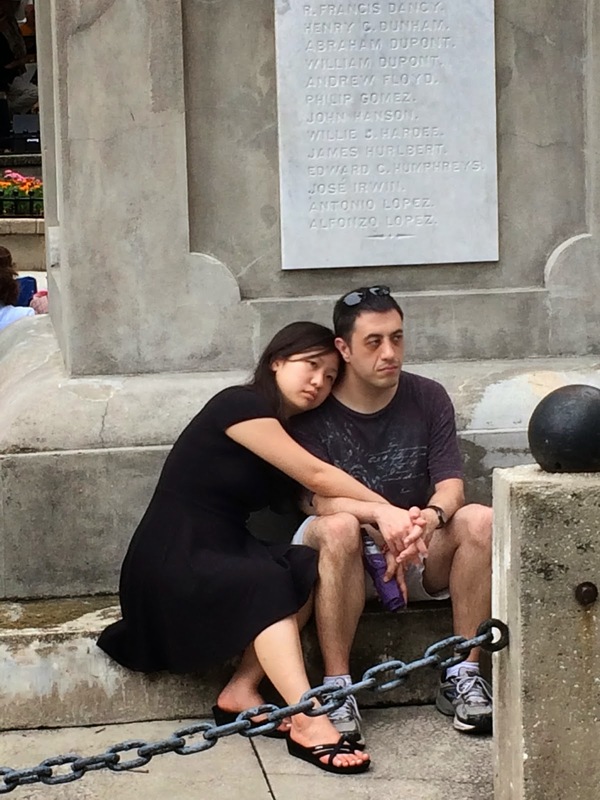 "Darling, why are we so sad on our country's birthday? Oh maybe because it is not our country?" "Hey! Who you calling a FLAG?!!" 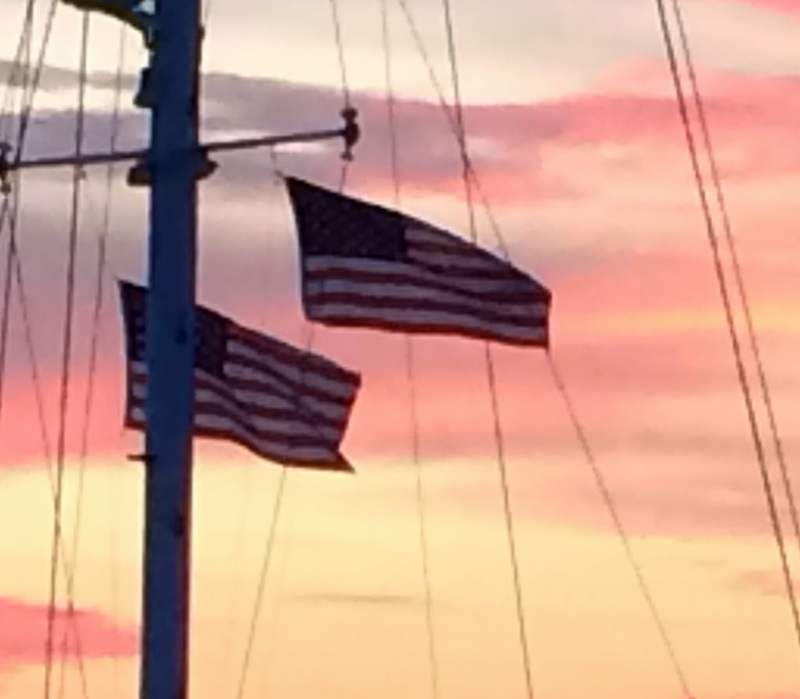 Another peaceful sunset from the mooring ball… All is well... even tho there is turmoil all around the world, you would never know it from here… today… here and now… Peace to all. 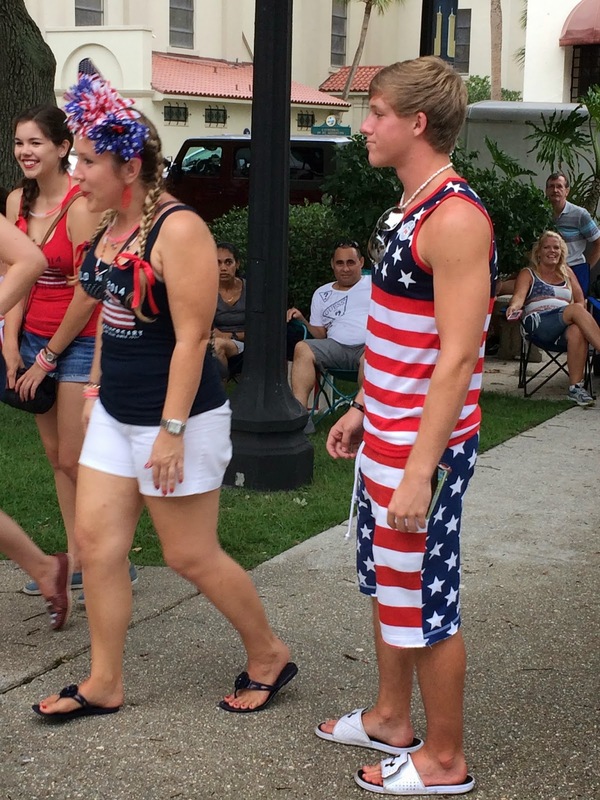 ….And crown thy good with brotherhood, from SEA to shining SEA! Can I get an AMEN?!! So what's next for Glory Days? Well, I am glad you asked that question, Maestro. STAY TUNED FOR ANOTHER SEGMENT OF ACTION, ADVENTURE AND MAYHEM COMING UP SOON! Ahhhhh.... Once again Glory Days is back in the rhythm enjoying the beauty and comfort of the Intracoastal Waterway (ICW). 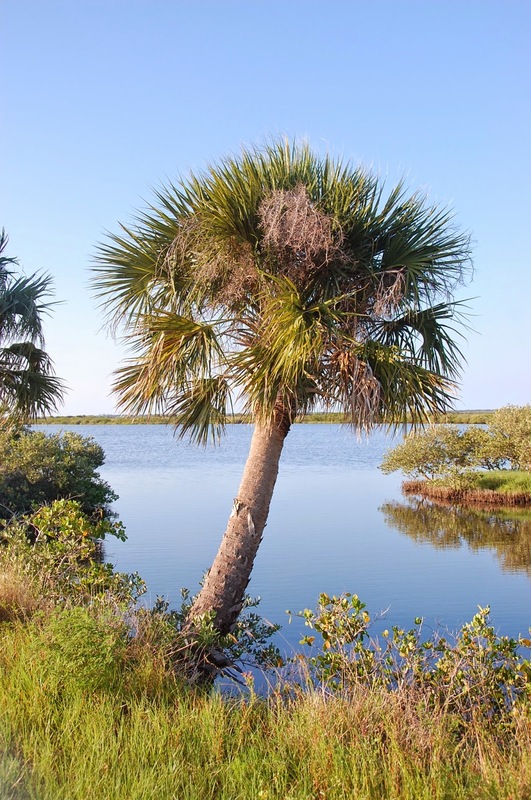 It is truly a magical place… from Norfolk to Miami, the Waterway stretches over a thousand miles (1065) through an endless maize of waters offering a scenic wonderland and magical experience for cruisers. 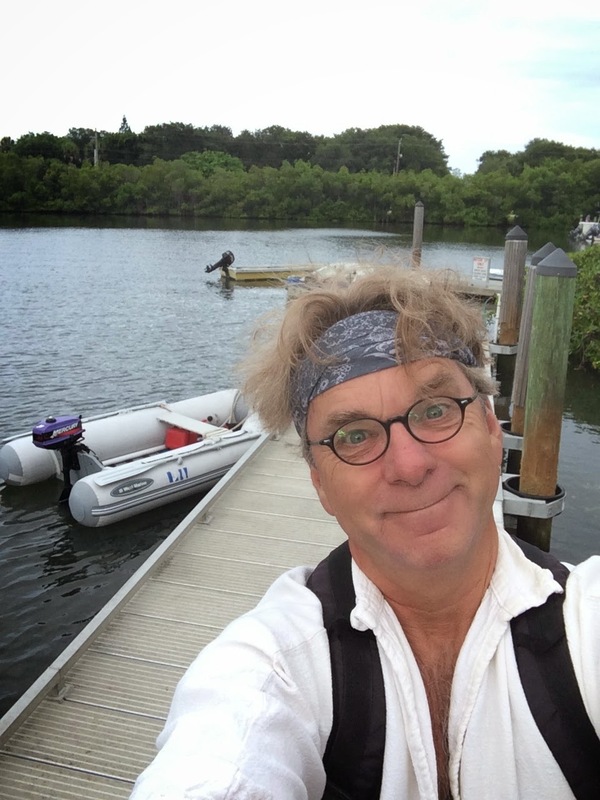 During the last 300+ miles from West Palm to St. Augustine, I have found so much to be thankful for such as relatively protected sailing waters and an abundance of wildlife in and along the waterway. And as I consider a September voyage north to the Cheasapeak Bay, I realize I have only covered barely a third of what this great Waterway has to offer. 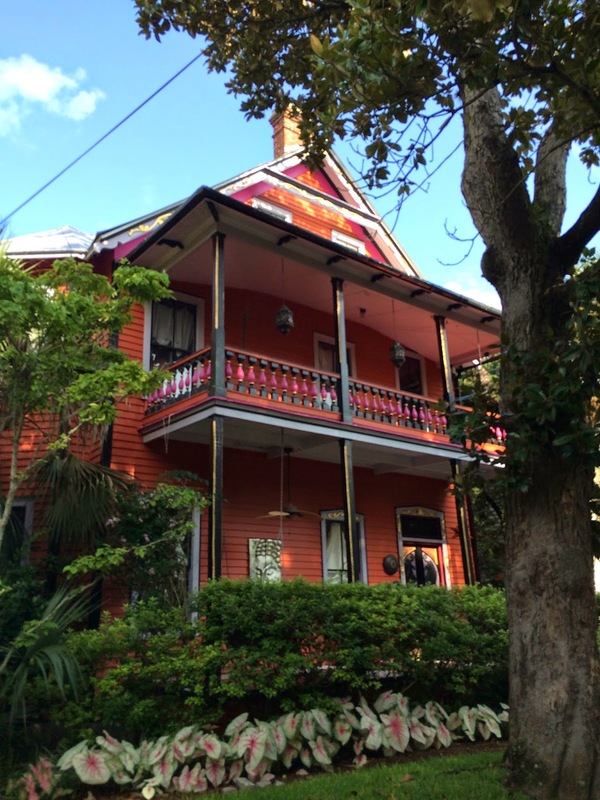 Suddenly, I found myself working my way north from West Palm Beach to my home port of Fernandina Beach, the northernmost Florida port on the east coast. With the Bahamas now behind me, I relished the thought of taking my time along this route for there is so much to see, hear, touch, smell, and touch along the way. It's like trying to describe the sky to a blind man... words just can't do it. When I was a teacher, one of my favorite assignments was take my whole class outdoors on a gorgeous day and say to them, "Kids, lay on your back, look into the sky and tell me what you see..." Some got it, while others were scratching their heads in mild confusion. That's sort of how I feel about the ICW.... Breathless, all encompassing… infinite. It also depends on how often you might be distracted by a pod of dawn dolphins, or an approaching thunderstorm, or the chills down your spine as an osprey soars above your mast while gripping a live fish in his talons. There are many reasons to stop and to just absorb the magic of the Waterway. It's best to not be in a hurry, my friend. 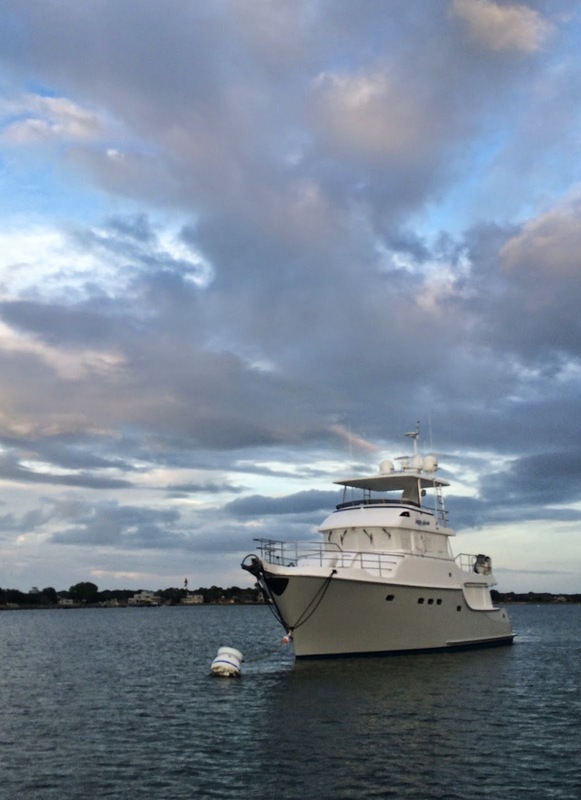 Glory Days enjoyed a two night stay in Riviera Beach Municipal Marina. Finally, she gets a fresh water scrub- down and some tender loving care before the next leg north. I know it looks like the Squatleys just moved into the neighborhood, but the shade tarp was a welcome reprieve from the heat… And the deck cans of fuel and water were handy in the Bahamas, but I I won't need them much longer now that I am back in the Land of Plenty, where water and fuel is more readily available. This is my preferred version of Route 66. An egret ignored me goodbye when I casted off the dock lines. I find it interesting all the various types of vessels you meet along the Waterway… everybody seems to be going somewhere… There's all shapes and sizes of craft… The Daytona area was particularly crowded with power boats on the Sunday that I left… zoom zoom zoom… all around me. If under power, I typically make about a speed of about 5 knots… which means I get passed a lot. 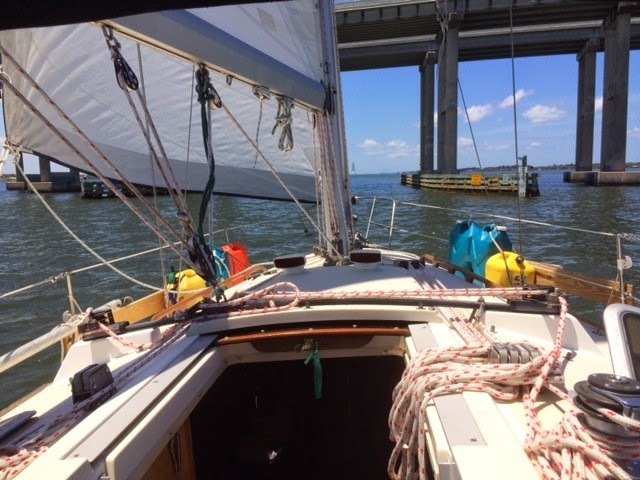 Thankfully, there is a very wide section called the Indian River, and if the wind is coming from the East like it was most of this week, it can make for some fine sailing in protected waters… I was able to maintain 6 knots on a comfortable beam reach for a couple days mostly under the comfort of the auto pilot … sweet. Going at such a slow pace always invites the topic of boater etiquette when being passed by another vessel. If someone is passing a slower vessel, the polite thing to do is for him or her to call you on the VHF and request to pass. It's not really a request, because they are going to pass your regardless, but it's the thought that counts. Much of the marker and sign repair is done by volunteers… Nice gig for a Monday morning. My itinerary north went something like this… as best I can recall from my log notes… i'm not a very good logger. The old tide chart on the iPhone is valuable most everywhere… finding real paper tide charts is not easy anymore…. it's good to know if you are entering a pass or inlet whether you're going in gently or getting banged. 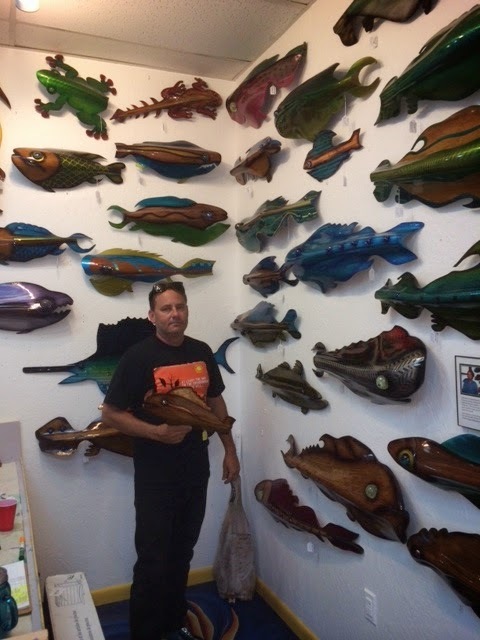 In Cocoa Beach, I met this artist who makes these incredible fish art pieces by using the base of a huge palm frond (leaf) as the medium… I was impressed. Cocoa Beach has a nice little downtown area with lots of eateries right on the water… There's probably not a more famous highway in Florida than A1A… It runs along the entire east coast through every single beach town and bridge along the way… also the title of Jimmy Buffet's first album, A1A. 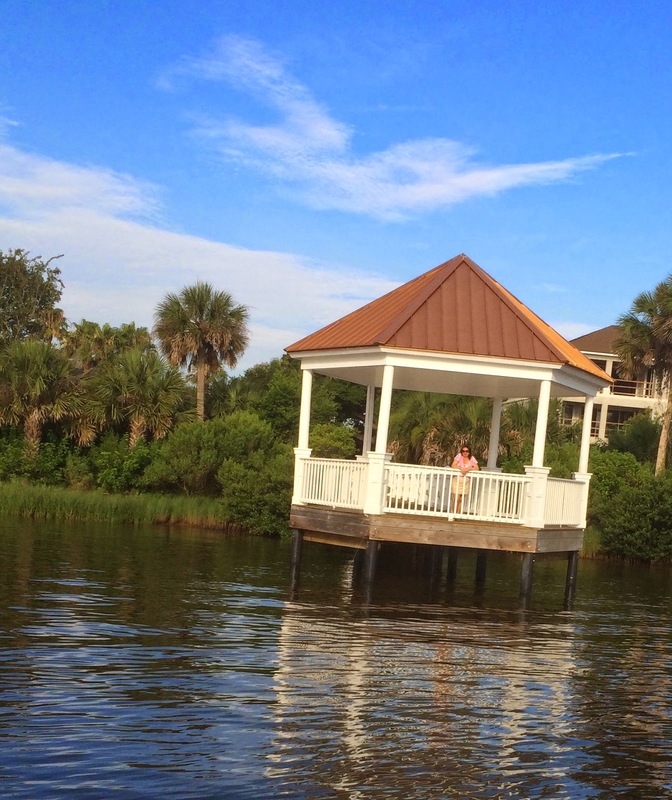 This sweet lady smiled at me as I passed her gazebo somewhere unknown along the Waterway … hello, goodbye… here for now, now gone… have a nice day, whoever you are… I'll never see you again… It all happened in a blip. 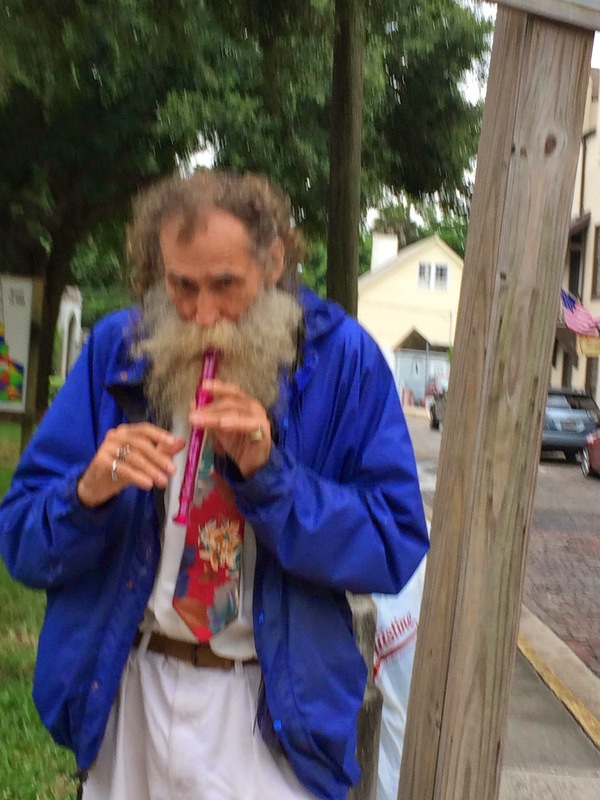 Just a few miles from Titusville, Fla is a real treasure I stumbled upon. I met a friend who had a car and offered to take me into the Black Point Wildlife Reserve for a few hours… it turned out to be a wonderful experience in birding and getting away from the boat for a while… Here's some of the photos taken in the wildlife preserve. I sure love birding. I just wish I knew the names of all them.., I'm pretty good at it, but there's far more to learn. Florida has a plethora of bird variety… me like. The Red Wing Black bird. These guys were plentiful here. 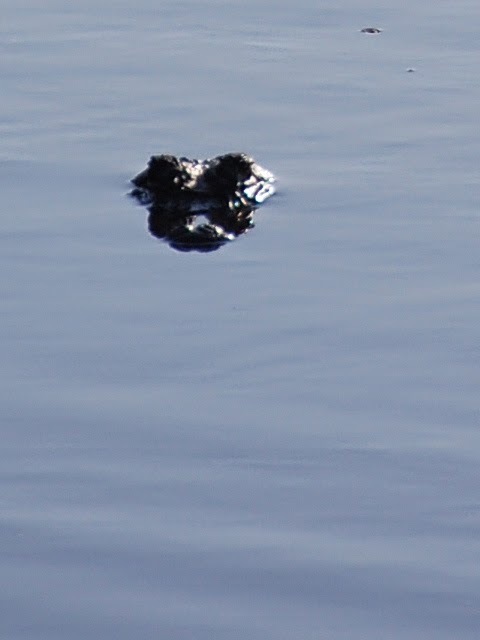 A gator is a natural when it comes to lurking… he's just waiting for the perfect moment. Then I spotted this gorgeous bobcat crossing the road… meow. We spotted him from the car… and the amazing thing is that is that he did not run away instantly… for about 30 seconds he posed before slipping away into the bush… I was in awe… a wild cat… he looked hungry… or was it a she? I'll never know. Tidal marshes form these lake-like bodies of water that are rich is wildlife… gators, herons, egrets, white pelicans, and spoonbills were in their niche here. It's quite moments like this that continue to make it all worthwhile… but was there ever really a question about that? 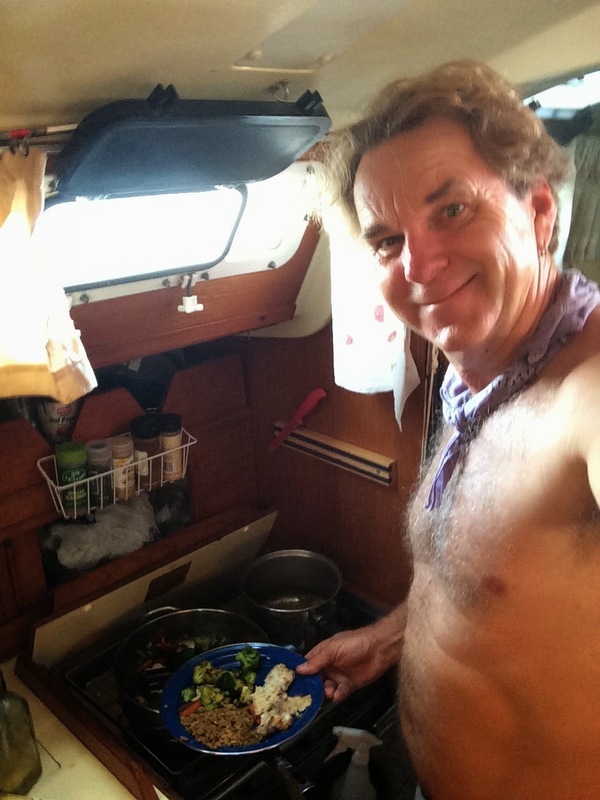 As I continued north, I soon came upon a section of the ICW called The Haulover. This areas is a narrow canal that connects the Indian River to Mosquito Lagoon… Lots of folks were fishing here. Before entering the canal, I couldn't help but notice a small island that was the most abundant rookery of birdlife that I had ever seen in my live… I had to see more, so I dropped anchor on the edge of the channel, narrow as it was. 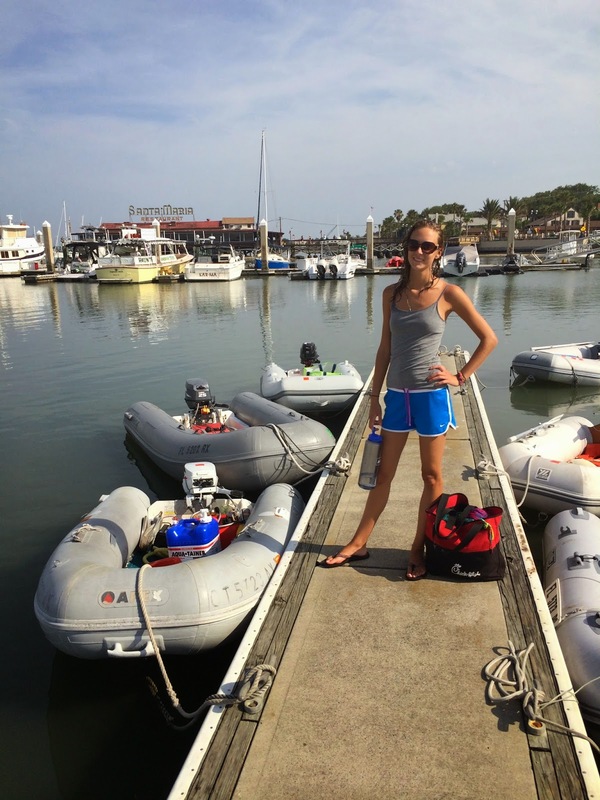 Suddenly, a few minutes turned into an hour of paddling quietly in the dinghy…. what a a nice rest from a long day along the waterway. I'm sure this couple was into some sort of mating ritual… the guy on the right kept prancing all around her with his head feathers all cackled up and spikey-horny like. She danced and evading him gracefully while he kept up the mayhem for his quest for her love… I never saw them mate… it's all in the courting process I suppose. They never really took a break from what I could tell… Foreplay certainly has it's place and should never be abbreviated. 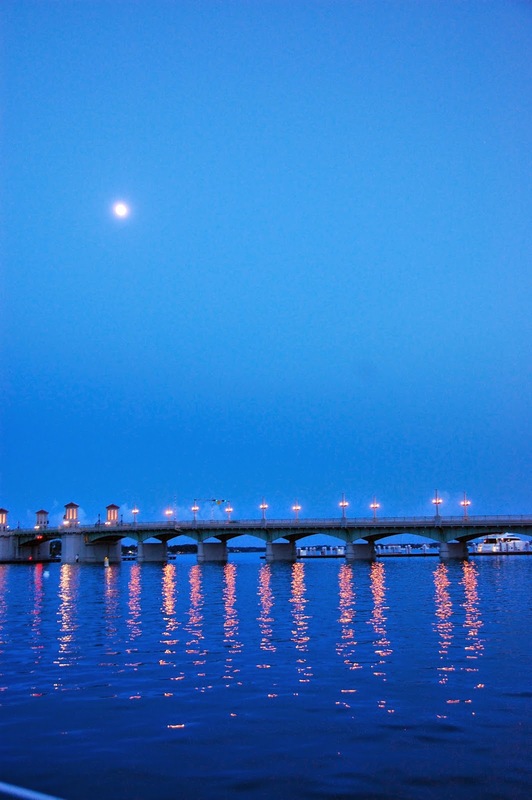 The view from the Titusville bridge is a peaceful way to end a good day of wildlife-ing…. an easy day… and time for a rest. and I guess I am inside. This is another rookery of pelicans that have decided to occupy a small island right in the middle of the harbor at New Smyrna Beach. Interesting to view, but quite pungent if you are downwind of these guys… lots of nitrogenous urea going on here. Six months ago, I would have never passed under a bridge while under sail… but it's nothing and just seems natural, as long as it's a reasonable blow and all is in control… suddenly, hard things seem easy… Technically, it is not legal to sail through a draw bridge, but this was not a draw bridge, just a 65' clearance bridge… I only need 47' to clear… check out the video below. Then there's the story of the tangled manatee. 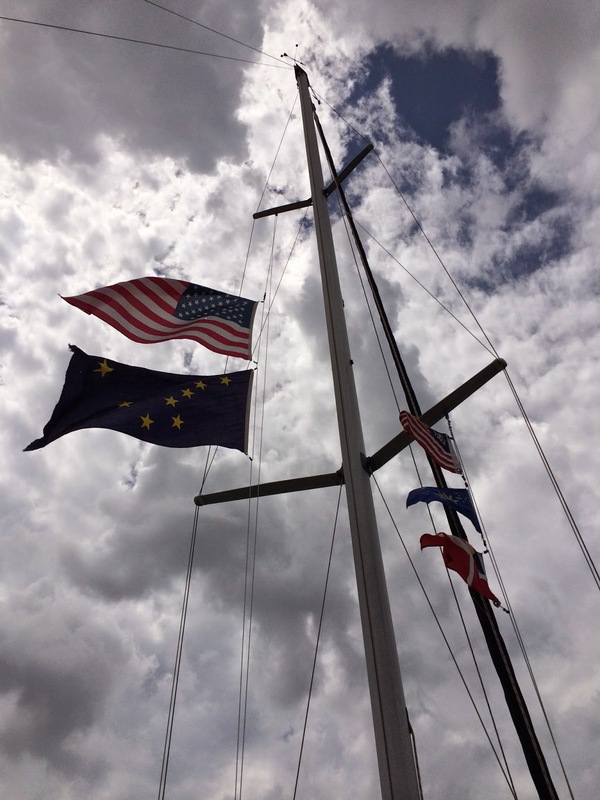 The VHF alarm sounded, indicating a severe weather watch approaching… I dropped the sails as a huge black cloud was growling in the north .. I anchored in a very narrow channel (called Cement Plant) to hunker down as this heavy storm was approaching from the NW. In a narrow anchorage such as this, it's a good idea to put out a second anchor from the stern so that the boat remains in the center of the canal and does not get blown into the shore in a wind shift…. so far no problem. 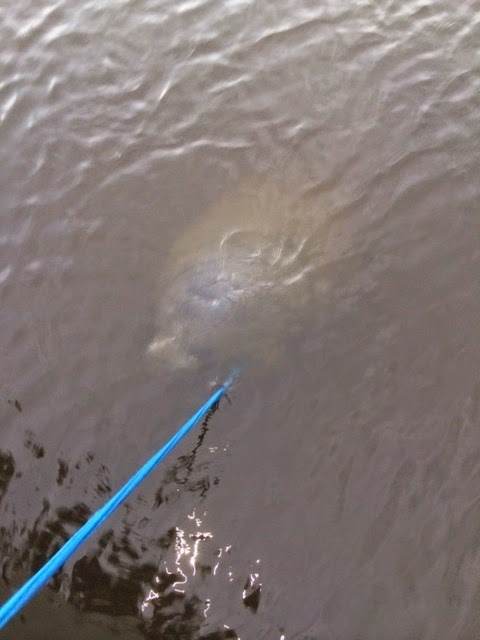 After setting the 2nd anchor, I noticed that the anchor line (rode) was bouncing around kinda weird-like… When I tugged on the anchor rode, I was surprised to find this huge mama manatee all tangled up in the rope! Finally, after giving her more and more slack, she set herself free and I kissed the sky…. what a thing to see. But after that, she wouldn't leave! 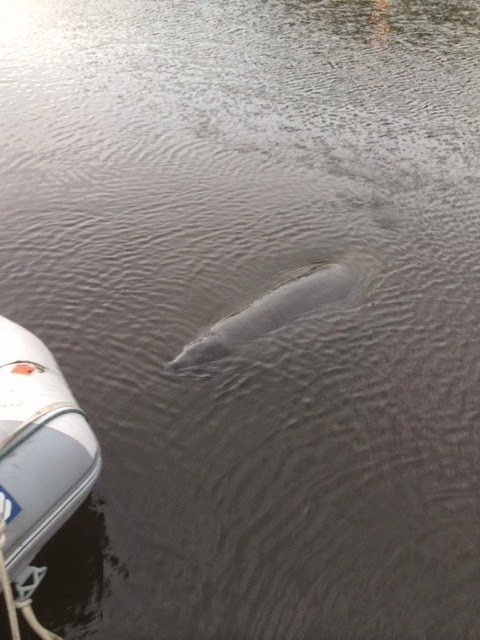 For the next full hour she bumped my dinghy and licked the side of my boat… I like to think she was just sending her love and thanking me for saving her life… actually, she saved mine tho she never knew it. 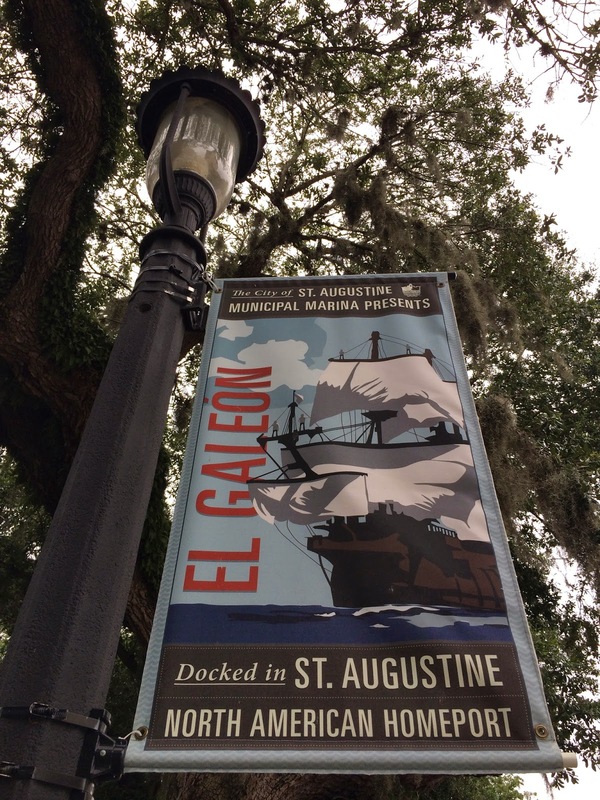 We'll that's about it folks for this post… I left early the next morning of June 10 and had an absolutely gorgeous and peaceful trip of 25 miles to the historic town of ST. AUGUSTINE! So that's where we will leave off for now… I've now covered about 1400 miles on this trip since starting on Jan. 1, 2014… just getting started!Please STAY TUNED for the next post (#73! 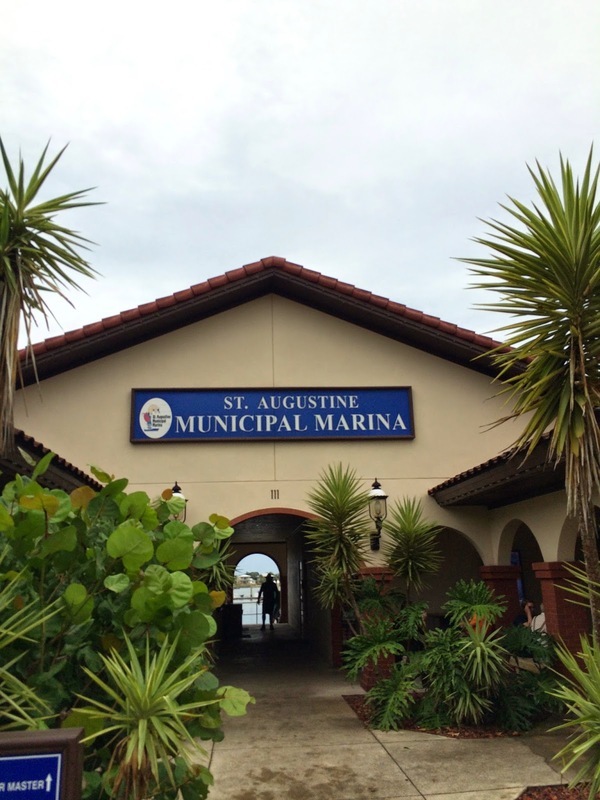 )… titled ST. AUGUSTINE… DO OR DIE! Yes, I'm crazy…. about life! 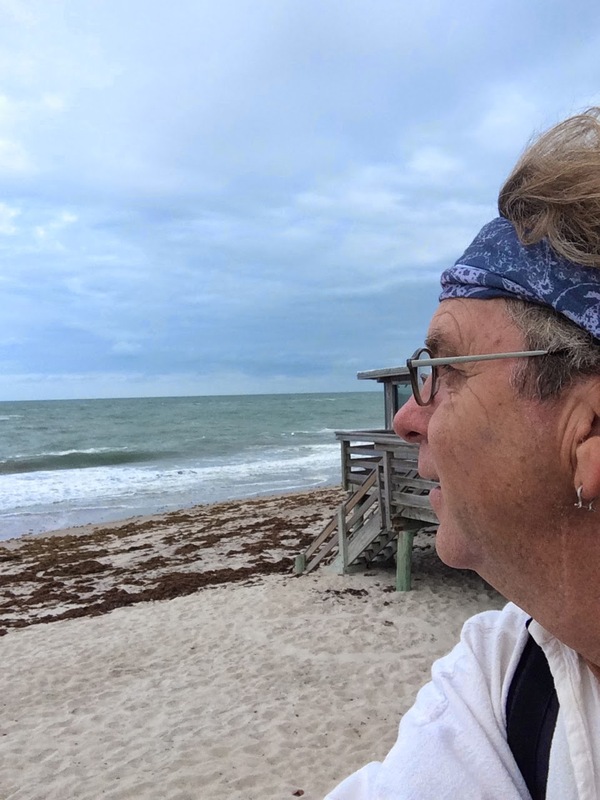 I had to fly back to Atlanta for a couple weeks during this ICW passage north… While there, I wrote this little song to honor my dear Aunt Frankie who recently passed into the wild blue yonder… wow, what a spirit she was… i hope you like.